Start your day flowing through a practice that is truly profound and invigorating. Sara teaches a dynamic style of Yoga, based on the principles of the anatomical alignment of the body, where breathing guides and enriches each posture. Progressive sequences of Asanas, alignment, breathing, awareness and clarity are key elements in using body intelligence with benefits for each practitioner. Johanna will continue and guide you trough a gentle yoga & qui gong flow focused on opening the heart and finding balance through movement and breath. As we are slowly transitioning from active (yang) into passive (yin) you are invited to slow down and create space to go deeper and connect with yourself and shift from active to more receptive. You will finish with a deep relaxation (yoga nidra) guided by Martina to invite your body and mind to drop into the state of being and nourish and rejuvenate yourself in the deep rest. We invite you to partner-up and move through a few fun yoga poses together whilst giving and receiving each others body weight to trust and support each other. It is a fun and relaxing way of sharing your Yoga practise. What a better way to end your morning practice before Brunch? 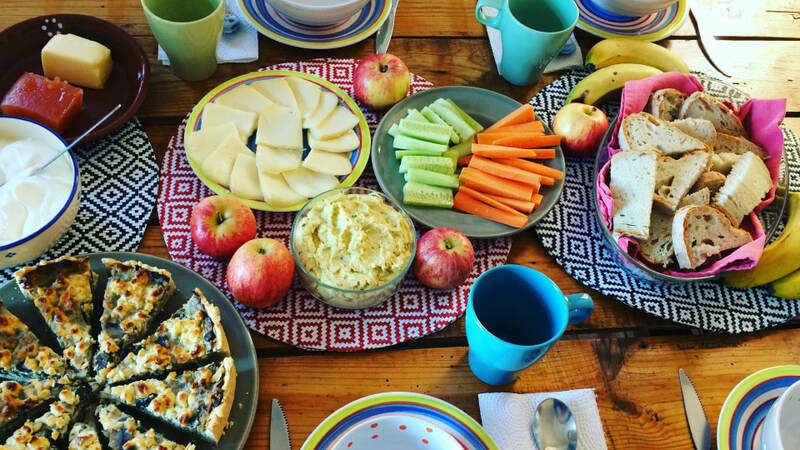 We will prepare a yummy and healthy brunch for you incl. vegan options, homemade quiches, spreads, salads, seasonal fruit, tea, coffee and sweet little surprises. Indulge and connect with each other, relax on the deckchairs and enjoy the view. After lunch we invite you to sit with us for a contemplation, reflection, meditation and feedback. There will be fresh lemonade, fruit and snacks throughout the morning, as well as a delicious vegetarian brunch. Plus deckchairs, sunbathing and a gorgeous view to relax and connect! Please bring your own mat! We have a few mats there for back-up, but if you have your own, you can help us immensely by bringing it. I have read and accept the booking terms as described to the right of this form. We would love to see as many of you joining us for the Rooftop Yoga Spring Festival. To help us organise this event, we ask that you please have a look at the following terms and conditions, which help to minimise the risk, financially and otherwise. 1) In order to secure your place, the full fee is payable in advance. Payments are non-refundable. 2) We reserve the right to change your sessions in the event of a tutor cancellation, which is beyond our control (due to illness or other personal reasons). 3) You will be solely responsible for your own belongings at the event. ​4) You are obliged to advise the tutors of your sessions of any health issues or injuries which may affect your practice. Please take responsibility for your own health. Costa do Castelo is just outside the wall of Saint George Castle, at a walking distance from Rossio Metro station. Exit the Metro station at PRAÇA DA FIGUEIRA, follow the tram rails along RUA DOS FANQUEIROS until number 170, take the free elevator to the castle (open 9am to 9pm), exit the building, turn left and cross the street. You will see a new white building with a ‘Pingo Doce’ Supermarket; inside there is another elevator (operates 24 hours) that takes you straight to the street of This Is Lisbon. Go left on COSTA DO CASTELO and after 400m, you see This Is Lisbon on your left. ​​​IMPORTANT NOTICE: Due to building work, Rua da Costa do Castelo is closed (for cars and pedestrians) coming from the elevator side. To get to This Is Lisbon, you need to go via Escadinhas Marquês Ponte de Lima (through Mouraria) or via Calçada de Santo André (from Martim Moniz or Graça).